31 Dec 2016 - The 2016 Kansas Cyclo-Cross Season wrapped up with the Christmas Week of Cyclo-Cross which consisted of three races during the final week of the year -- Boxing Day 'Cross, the mid-week Grote Prijs Shawnee which was held under the lights as an avondcross (that's Flemish for "evening 'cross"), and 'Cross Off the Old Year race. Osceola Velo Club's Pat Schlager was there for all three races and accummulated enough points to finish in 2nd place overall in the Single-Speed category in the 8-race Series60CX points series. Check out some photos of Pat S. in the final races of the 2016 season. 27 Nov 2016 - Osceola Velo Club's Pat Schlager finished 8th in Single-Speed in the Fast and the Furriest Cyclo-Cross race held on the grounds of the Humaine Society of Greater Kansas City. The day was chilly, overcast, and windy with rain falling on the second lap of Pat S.'s race -- typical 'cross weather. Check out some photos of Pat in Kansas City. 20 Nov 2016 - Osceola Velo Club's Pat Schlager held onto his 4th place overall in the Single-Speed category in the 13-race 2016 Kansas Best Cyclo-Cross Rider (KBCXR) points series with his 9th place finish in the 360 Cup held at Centennial Park in Lawrence, KS. Check out some photos of Pat S. at Centennial Park. 13 Nov 2016 - Osceola Velo Club's Pat Schlager made the long drive up to St. Joseph, MO on Saturday for the Robidoux Roundup Cyclo-Cross race held at Hyde Park. This year's course included this park's trademark super steep run-up and broken stone stairs under the stone bridge, as well as lots of technical sections. Pat S. finished 5th Saturday in Single-Speed. Sunday's race -- the Keen Wealth Classic -- was held at the beach shelter at Wyandotte County Lake Park and featured lots of climbing of the adjacent hill/ridge as well as a fast stretch along the lake's shoreline including a couple of sandy bits. Sunday's race also served as the State Championships for category racers (but not for single-speeders, for some reason). Pat finished 13th in Single-Speed on Sunday. Check out some photos of Pat at Hyde Park in St. Joseph. 06 Nov 2016 - Osceola Velo Club's Pat Schlager finished 12th on Saturday in the Colavita Cup and finished 11th on Sunday in the Boulevard Cup in Single-Speed. Both races were held in rather mild conditions at Stump Park in Shawnee, KS. Both days' courses included a rather abrupt, steep-sided "creek crossing" and standard cyclo-cross barriers, while Sunday's course also included a very steep and very long uphill section which only the hardiest of racers were able to grind up while riding their bikes. Check out some photos of Pat S. at Stump Park on Sunday. 30 Oct 2016 - Osceola Velo Club's Pat Schlager finished 11th on Saturday and 9th on Sunday in Single-Speed at the Cyclo-Cross at Raytown BMX race. Pat S. felt right at home on the banked curves of the BMX track, part of each day's course that included part of the track itself as well as plenty of the adjacent bumpy grass field. Check out some photos of Pat at Raytown. 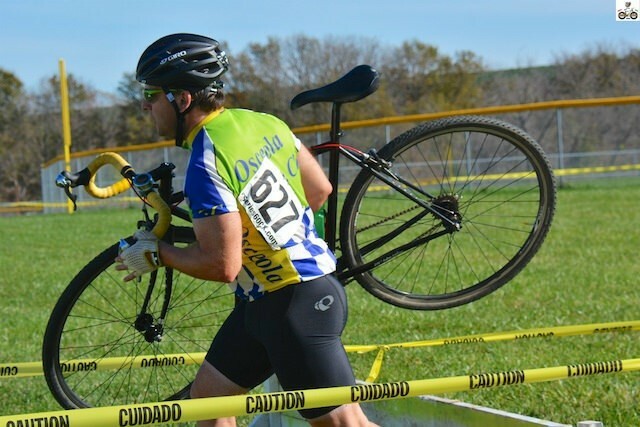 23 Oct 2016 - Osceola Velo Club's Pat Schlager finished 5th on Saturday and 7th on Sunday in Single-Speed at the Capital Cup Cyclo-Cross race held at Menninger Hill in Topeka, KS. Pat S.'s finish on Sunday was jepordized by a double puncture exiting the tricky gravel section early on his 3rd lap which forced Pat to finish the race on foot, pushing/carrying his disabled bike. Check out a photo of Pat warming up on Day 1 in Topeka. 16 Oct 2016 - Osceola Velo Club's Pat Schlager enjoyed another successful weekend of cyclo-cross racing, this time at the Joules 'Cross held just outside of Lawrence, KS. Saturday's weather was cool, cloudy, and windy, perfectly complimenting the course feature of the day -- the mud pit -- which got deeper and sloppier every lap of every race. Sunday's weather was unseasonably warm, sunny, and wndy which went well with the dry and bumpy course layout that day. Pat S. finished 8th in Single-Speed on Saturday and 5th on Sunday. Check out some photos of Pat at Joules. 09 Oct 2016 - Osceola Velo Club's Pat Schlager raced both days at the Cliff Drive Cyclo-Cross race held at Kessler Park in Kansas City, MO on a tough/trying course. Pat S. finished 7th each day in Single-Speed. Check out some photos of Pat at Cliff Drive. 01 Oct 2016 - Osceola Velo Club's Pat Schlager was on hand for the Castle 'Cross held just south of the Jazz District in the heart of Kansas City, MO. A wide variety of race surfaces and a couple of natural obstacles made for a fun yet very challenging course. Pat S. enjoyed all of these challenges to finish 10th in Single-Speed. Check out some photos of Pat at "The Castle." 18 Sep 2016 - The 2016 Kansas Cyclo-Cross Season kicked off this weekend with the Prologue 'Cross held at Blue Valley Park in Kansas City, MO. Osceola Velo Club's Pat Schlager and Pete Williams were there both days. Pat S. finished 9th on Saturday and 9th on Sunday in Single-Speed. Pete W. doubled up on Saturday with a 5th in Masters 60+ and an 18th in Men's Cat 4. Pete finished 6th in Masters 60+ on Sunday. Here are some photos from the cyclo-cross season opener. 27 Aug 2016 - Osceola Velo Club's Pat Schlager finished 2nd in the Masters 40+ Match Sprints at the Missouri State Track Championships held at the Penrose Park Velodrome in St. Louis, MO. Pat S. posted a Personal Best Time (for Penrose Park Velodrome) in the qualifying Flying 200 Meters Friday evening. Pat's qualifying time was also the fastest of the evening which seeded him 1st in the Match Sprint bracket to be contested the following day. Pat went 1-2 in the best-two-out-of-three in the Final round Saturday, including two near photo finishes in Heats 1 and 3, and a re-ride due to a rear wheel puncture during Heat 2. Here is a photo of Pat on the podium in St. Louis. 10 Aug 2016 - Osceola Velo Club's Pat Schlager finished 10th in the Men's 55-59 Match Sprints at the USAC Masters Track National Championships held on the Major Tayor Velodrome in Indianapolis, IN! Pat S. posted a new Personal Best Time of 13.835 seconds in the qualifying Flying 200 Meters on the 333 meter long, 28 degree banked track in Indy. Unfortunately for Pat and many others, the skies opened up drenching the outdoor track causing a 5-hour rain delay. Because of the long delay, the 1/8 Finals of the Match Sprints were cancelled, with just the top eight qualifiers contesting the 1/4 Finals in the early evening. Still hunting down photos of Pat on the banking in Indy, but here are some photos of the facility and track. 31 July 2016 - Osceola Velo Club's Pat Schlager is the repeat State Champion in the 500 Meter Individual Time Trial! The 2016 Kansas State Track Championships were held today in varying weather conditions (light rain, cloudy, bright sunshine, downpour, sunshine) at the Lawrence Grass Velodrome just outside Lawrence, KS. In addition to Pat S.'s Gold Medal, Osceola Velo Club's Pete Williams was awarded the Silver Medal in the 500M Individual Time Trial and the Silver Medal in the Age Scratch Race. Great racing, Team! Check out some photos of Pat and Pete racing at the 'Drome. 28 July 2016 - Osceola Velo Club's Pat Schlager and Pete Williams competed in the Thursday Night Omnium Training Race Series which was held weekly out at the Lawrence Grass Velodrome located just outside Lawrence, KS. 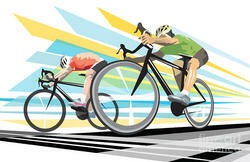 The six races which made up the Omnium were the same six races which make up the Olympic Omnium -- The Flying Lap, Scratch Race, 500 Meter Individual Time Trial, Points Race, Individual Pursuit, and Elimination Race. Pat S. raced all six weeks while Pete W. raced the final five. Pat's 1st place in the 500M ITT and 3rd in the Flying Lap scored him sufficient Omnium points to secure 4th place overall in the Series. Pete finished 7th overall thanks to his 3rd place in the Scratch Race. Check out a photo of Pat at the podium presentations. 05 Jun 2016 - Osceola Velo Club's Pete Williams went the full distance in the Dirty Kanza 200! The DK200 (as it is known by those "in the know") is a 200-mile gravel-road bicycle race which takes place in the Scenic Flint Hills of Central Kansas. The DK200 has become THE premier endurance gravel-road bicycle race in the country attracting the creme de la creme of the "gravel grinders." Pete W.'s official elapsed time of 18 hours/34 minutes/33 seconds was good enough for 36th place in his age group. Way to go, Pete! Check out a photo of Pete grinding the Scenic Flint Hills. 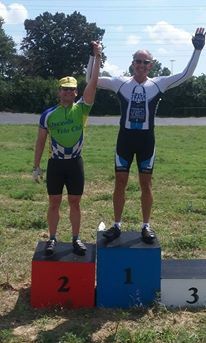 19 May 2016 - Osceola Velo Club's Pat Schlager finished 1st in his class -- "Retro Merckx Single-Speed" -- in Race # 1 of the monthly John Brown Time Trial Series held just outside De Soto, KS. Although the weather was chilly and cloudy with a hint drizzle, the fairly flat, out and back course was tailored made for Pat S.'s fixed-gear track bike. 24 Apr 2016 - Osceola Velo Club's Pete Williams finished 19th in his age group with a time of 8 hours/55 minutes/49 seconds in the 100-mile Cool Hand Luke Gravel Grinder race which was held around Leavenworth, KS today. Check out some photos of Pete W. grinding the gravel. Next up for Pete -- the DK200. 09 Apr 2016 - Osceola Velo Club's Pete Williams competed in the Gravelleurs Raid, a 100-mile gravel road race held in the rolling hills north of Lawrence, KS today. Pete W.'s overall time of 8 hours/38 minutes/5.281 seconds was good enough for 27th place in his age group. This race, along with the upcoming 100-mile Cool Hand Luke Gravel Grinder race, are mere warm-ups for the big one -- the Dirty Kanza 200, a 200-mile gravel road race through the Flints Hills of Kansas, to be held on 04 June this year. Check out some photos of Pete at the Gravelleurs Raid. 17 Feb 2016 - The dates have been set and the permit application has been approved USA Cycling, so mark your calendars for Coach Pat's 2016 Sprint Clinics presented by Osceola Velo Club! Area racers will once again have three opportunities (21 Apr, 28 Apr, & 05 May 2016) to learn all of the finer points of sprinting by none other than KCA Hall of Fame & USAC Licensed Cycling Coach, Coach Pat. Information and link to the event flyer can be found at http://kscycling.org/events/coach-pats-2016-sprint-clinics/.